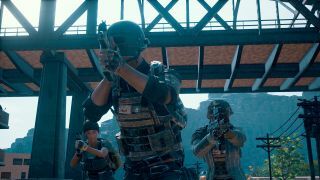 After recent leaks all but confirmed that PUBG was coming to PS4 in December, Sony has officiated the news with a firm launch date and the availability of pre-orders. On the official PlayStation site, PlayerUnknown’s Battlegrounds is currently up for pre-order in three different editions, all with a release date of December 7, 2018. It will also feature all three currently available maps – Erangel, Miramar, and Sanhok – with the winter-themed Vikendi to arrive shortly after launch. The base game is called the Looter’s Edition, seemingly because you’ll have to start from scratch with your in-game wallet empty of both G-Coins and BP, the game’s two native currencies used to purchase skins and other items. Or, you could spend considerably more and grab the Survivor’s Edition, which nets you the Vikendi Event Pass as well as 2,300 G-Coins and 20,000 BP. The Champion’s Edition is identical, although you’ll score yourself 6,000 G-Coins instead. All three editions arrive with bonus PlayStation-exclusive skins and items if you pre-order them, including Nathan Drake’s desert outfit from the Uncharted series, and Ellie’s backpack from The Last Of Us. The PlayerUnknown’s Battlegrounds Looter’s Edition will set you back $30 (£25 / AU$40), while the Survivor’s Edition and Champion’s Edition will set you back $60 (£40 / AU$70) and $90 (£50 / AU$85) respectively.